‘Known to many as a “walking library” because of his incredibly deep knowledge of Oromo history, Edao Oda is a long-time member of the Oromo community in Tennessee and a life-long participant in the Oromo national struggle. He is a father, a friend for many, and he has throughout his life selflessly helped others in need and devoted his time to researching and teaching about the Oromo people. Due to his commitment to the Oromo cause, he has sacrificed and suffered immensely as a political prisoner, torture survivor and political exilee. Obbo Edao Odaa Boruu Dorii is widely known as historian, he is also a legal expert, linguist and translator and fluent in many languages including in Afaan Oromoo, Amharic, English, French and Russian. He studied at General Wingate, Prince Mekonnen, Nefas Silk (pre- college). 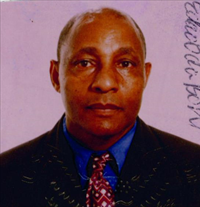 He studied undergraduate and postgraduate degree courses in Finfinnee (Addis Ababa) University, Moscow Institute of Economics and Statistics, University of London, Birkbeck College (Applied Statisttics and Operations Research), University of North London (MA Employment and Human Resources Studies), University of Westminster, London and University of Tennessee, Knoxville. Edao Odaa Boruu Dorii was born and brought up in Finfinnee. He and his family are among the survivors of indigenous Oromo of Finfinnee. He lived in Moscow, London (Camden Town) and Tennessee (Knoxville). Edao Odaa Boruu Dorii is pure, selfless, multi-genius, a champion of human freedom and Oromo superhero.